The unprecedented success of the last decade of Oregon football has attracted some of the nation’s most talented players and innovative coaches. For the Ducks, the point of no return was when Chip Kelly arrived, implementing a fresh, “Win the Day” philosophy that elevated the program to the national spotlight. 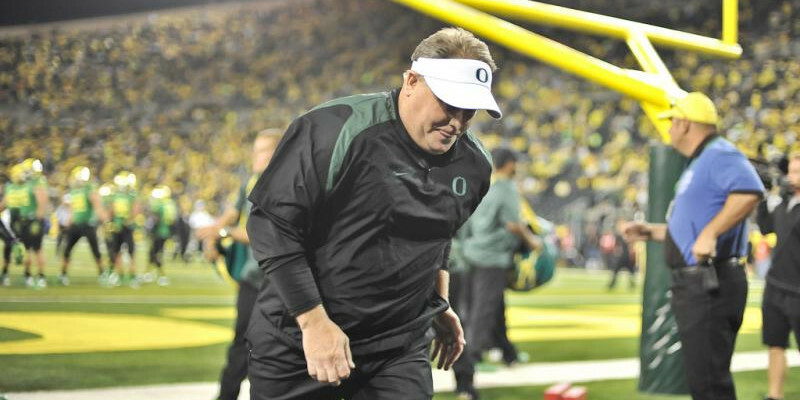 Chip Kelly transformed the Oregon football program into a national powerhouse. When Kelly left college football for the Philadelphia Eagles, his legacy in Eugene remained intact, a testament to his achievements and a solid foundation for sustained relevance in the rapidly growing market of college football. The proof of Kelly’s impact can be seen today as Oregon’s first Heisman winning quarterback, Marcus Mariota, is projected to be a top pick in the 2015 NFL Draft. The relationship between Kelly and Mariota at Oregon stirred up the creative theories and newfangled rumors of their potential reunion in the NFL. Everyone was starting to buy in, and even reputable senior analysts such as Sports Illustrated‘s Peter King entertained mock scenarios that paired Mariota with his college mentor. It was a truly exciting idea for Duck fans to see their stars perform every Sunday. And then it all came crashing down. In a recent press conference, Kelly dismissed these fantastic speculations, flatly denying any plan to trade up for the costly signal caller. Kelly’s statements (and clarifications of his role in the organization) came as a reality check, deflating a speculative draft bubble that teetered on the edge of absurdity. The innovative Eagles’ coach, whose reputation as a calculated risk-taker, took a surprisingly conservative position. “Marcus is the best QB in the draft. We will never mortgage our future to go all the way to get someone like that,” Kelly said. This stance was a far cry from perceptions of Kelly as rule-bending rogue, a high-roller with an insatiable desire for control and success. Did football fans and media alike get attached to a caricature of a man of their own invention? Sure. It’s only natural to be attracted to the unorthodox, prosperous men and their inaccessible genius. New England fans know all too well the frustrations in their inability to interact with Patriots coach Bill Belichick, one of the most successful NFL minds in the modern era. While Belichick’s post-game grunts and quiet disdain for the press have been amusing at times, he hasn’t sparked the type of social network sensationalism that has exploded in the past month involving Kelly and Mariota. Or were Kelly’s statements a sleight of hand maneuver, an attempt to distract the media’s watchful eyes desperate to catch a glimpse into Kelly’s strategic process? 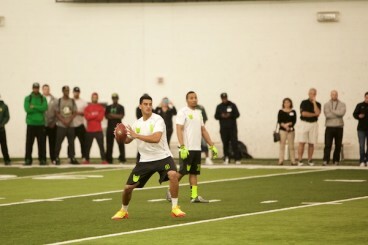 Marcus Mariota at Oregon’s Pro Day. According to CBS Philly, King agreed that the Eagles didn’t have the firepower to grab Mariota from the top five, but suggested that Chip’s recent statements were somewhat misleading. What we do know about Chip Kelly is that we really don’t know much about Chip Kelly. While the potential scenarios have been entertaining, the reality is there are larger controlling interests that ultimately dictate the Eagles’ direction. The business of professional sports is a high stakes chess game, a fiscal bloodsport between football ideologies, galactic-sized egos, and visionaries with deep pockets. Love it or hate it, this is the world of professional sports. And it appears as Kelly abides. Oregon fans want to see Mariota with Kelly because we want to see the NFL-version of the Oregon Ducks. Let’s just not let our imaginations get away from us.